After receiving her bachelor’s degree from Plymouth State, Amy returned to complete her NH teaching certification and taught middle school. With a growing family, she took some time off to be a stay-at-home Mom and worked part-time. 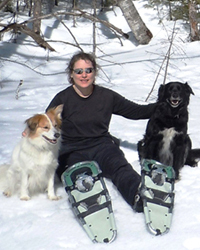 Because they love the area and outdoor activities, the Ueland family moved to Plymouth in the Spring of 2000 and Amy took a position as Adjunct Professor with the Department while she completed her M.Ed. Her graduate work involved habitat selection for the Canada Warbler. In addition to her adjunct work, in 2006, Amy was hired as the Department’s Technical Lab Specialist and Laboratory Coordinator. In the summer Amy teaches an intensive week long camp for middle school students. The camp is held at Plymouth State University and involves five different topic groups. The group Amy teaches is Ecological Expeditions. She and the students travel to local ecological sights to investigate different habitats and the organisms found within them.